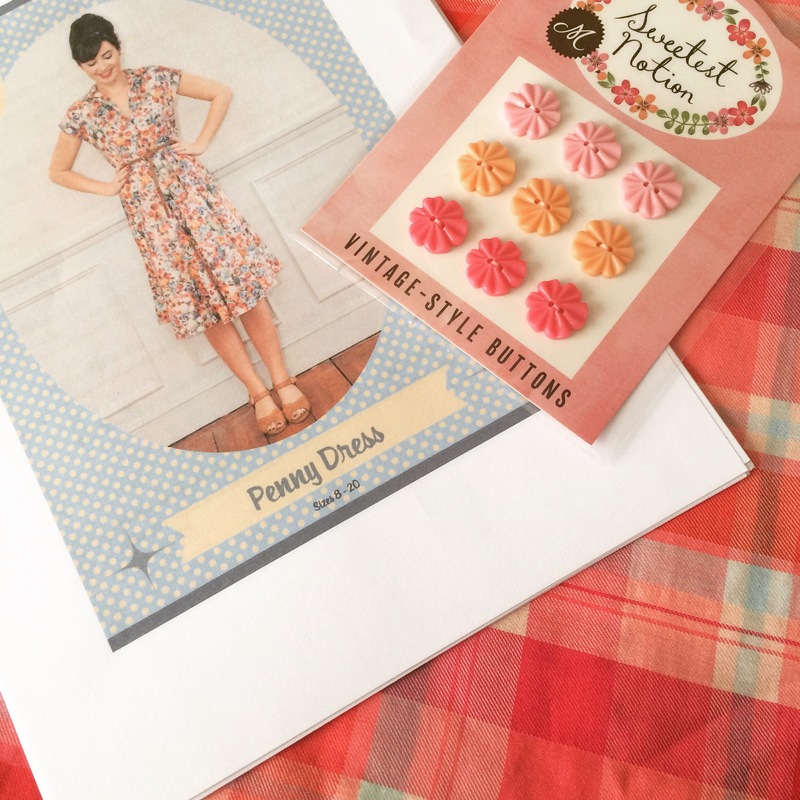 A couple of months ago I joined the Sew Over It PDF club, even though I typically prefer buying printed patterns. When the Penny Dress was released I knew I wanted to make one. 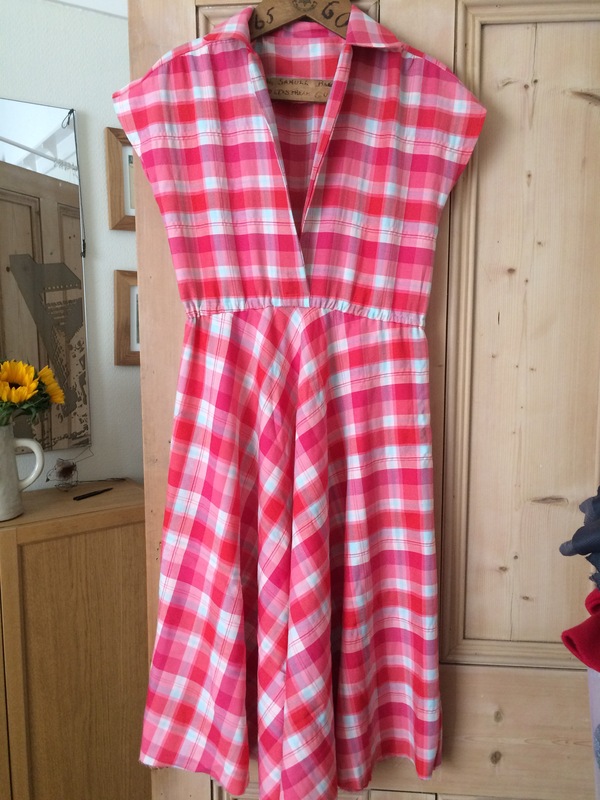 Once I’d printed and assembled the pattern I realised I needed wide fabric, which restricted what I could use from my stash, but I found some summery pink checked cotton that I’d had a while with no particular project in mind. I can’t remember where I got it but I know it would have been inexpensive. As the Penny only calls for three buttons I had plenty to choose from, and settled on some which came free with an issue of Molly Makes. I cut the size 12 as the fit looked fairly relaxed. 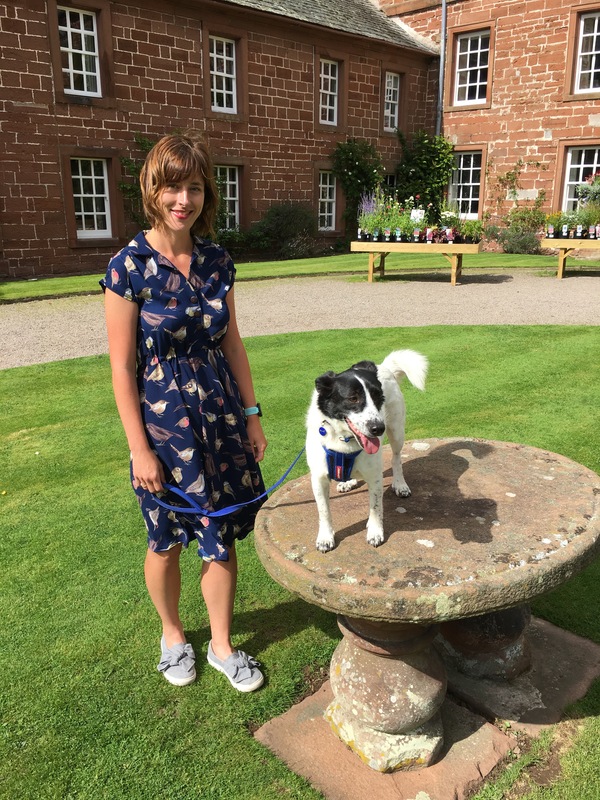 As I was making it I came across a couple of people online who were having difficulties with the collar, both of whom I consider to be much more adept and experienced. My collar went ok until it came to joining it to the interfaced button placket, as when I turned the bit under the collar (the lapel?) the right way out, the corner curled in. I trimmed my seams and wasn’t otherwise sure how to resolve it, so left it. It isn’t too noticeable but did mean I wasn’t able to topstitch the two front sections. I left the dress to hang for a couple of days before hemming, although I think it’s just a single fold hem, and as this fabric is quite prone to fraying may need a second fold at some point. 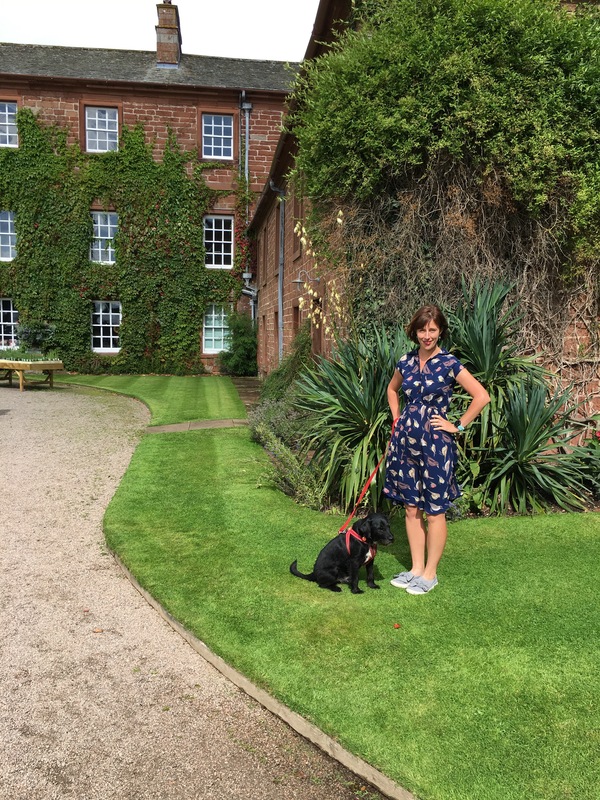 This dress is comfortable to wear, and although I initially considered shortening it to knee length, I think the midi length is right for the vintage style. I just borrowed this beautiful front door for a quick photo mid dog walk. I didn’t make any fitting adjustments to the second of my pair of Pennies, and this time used some crepe/viscose type fabric bought online from The Textile Centre. I love all things bird related so at £4pm this fabric was an obvious choice. I had some dark wooden buttons which seemed to match nicely. Although I didn’t do anything differently, for some reason I didn’t have the collar curling on this dress and so was able to topstitch as directed. Again I left the dress to hang before hemming – for a couple of w weeks for no particular reason. The only thing with this fabric is that because it’s a directional print, I have birds facing every direction at some point in the skirt. 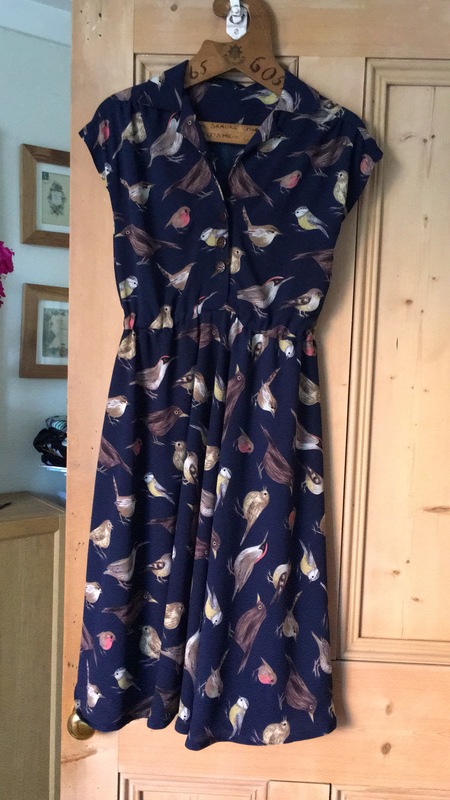 I think I could have reduced this by adding an extra seam – the skirt only has one – but I just tried to make sure that the birds right at the front were upright. These photos were taken at a pretty little National Trust property called Acorn Bank. 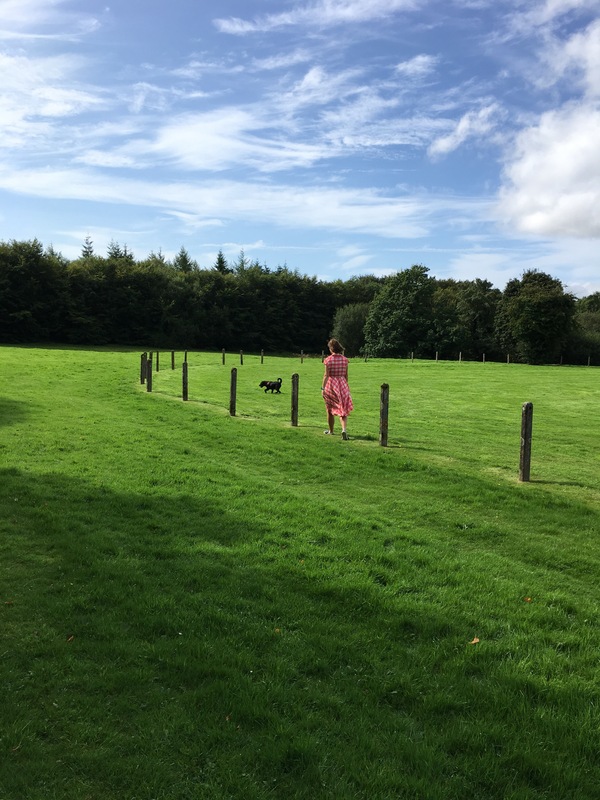 Believe it or not we managed to fit them in between two heavy downpours, even though the sun shone so beautifully for just long enough for the dogs and I to pose. I like both of my Pennies, though the bird one is my favourite. I think they will both get some autumn wear, with the colours of the bird fabric making that one particularly appropriate for the new season. Both of these dresses were complimented by complete strangers on their first time of wearing. 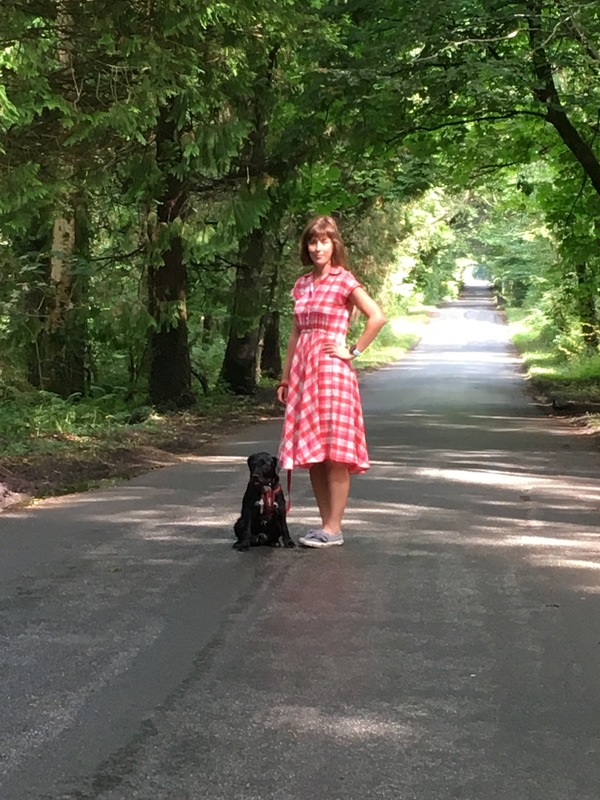 The checked dress was commented on by a lady cycling past, who called out “Beautiful dress!” and, as I held open a door whilst wearing the bird dress, another lady thanked me and then said my dress was stunning. I told her I had made it and she said she loved birds, and she was a vet who cared for them, how interesting does that sound? 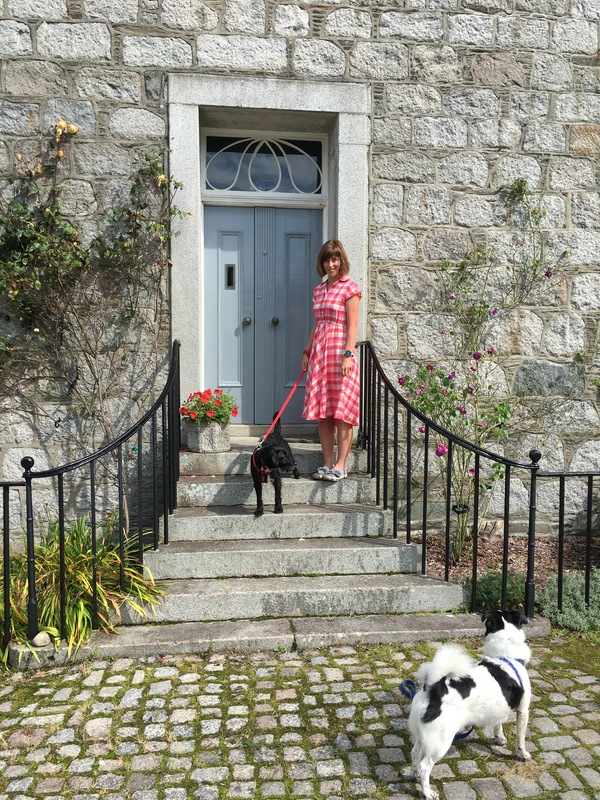 They both look lovely, I was tempted by the Penny pattern but I must have at least half a dozen shirt dress patterns already, so have so far resisted, they are so practical for work, in fact I’m wearing one today from your pattern destash last year! Lovely story about the vet and the fabric was a bargain. Great blog post, it’s always a treat to read your blog. 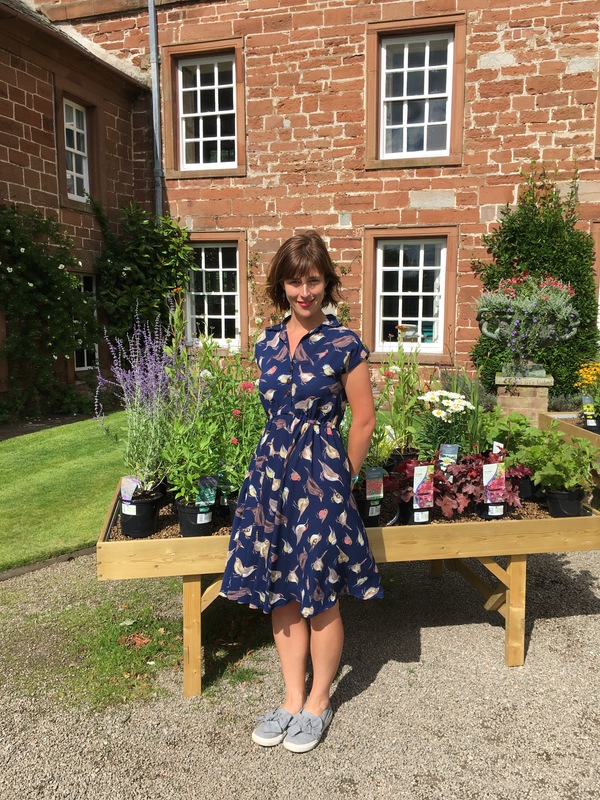 I like both these dresses both the fabric and the design, I might have a look at making the penny dress next spring. Very lovely dresses, particularly the viscose! Think you were right about keeping the length as the proportions are perfectly balanced. Hope you’ll enjoy more Pennys. Both dresses are lovely, I especially like the bird one. Very pretty dresses! I don’t think I’ve seen a Penny that I don’t like but I must say I love that birdy version! These are both stunning! I especially love the blue fabric.